Many of us are guilty of taking the easy road – we implement ITIL® in the areas in which we’re comfortable: Change, Incident, Problem and Request Management; take our incremental improvements and keep tweaking these and providing results. The truth is you can operate efficiently and save money by focusing on Service Operations and Continual Service Improvement, but you’ll only get so far. Many of our implementations are proof of this. The problem is that the improvements are incremental they don’t offer the business the competitive edge that full IT/Business integration does. We run more efficiently, but IT is still the same IT organization, just better. To fully integrate with the business and transform our relationship to business strategies, we need to expand beyond our comfort zone. To do so requires training. 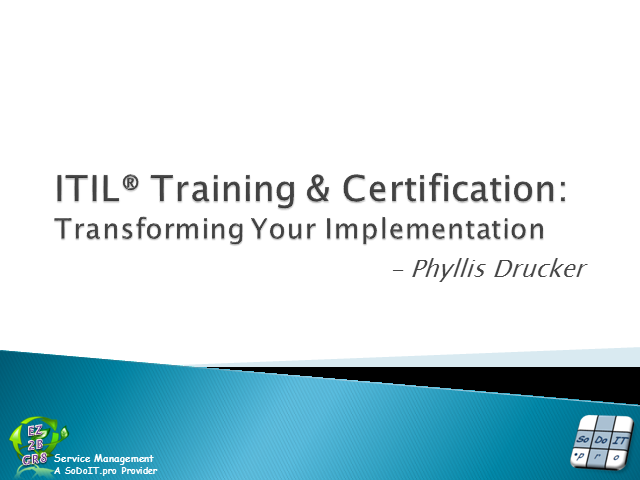 In this session, our presenter will offer some perspectives on her recent journey to gain ITIL® v3 Expert Certification after almost 15 years in the industry, along with an insider’s look at what she learned in the process and the value training and certification provide to you, to your peers and to your business. Additionally, she’ll offer information on the many styles of training from simulations to certification and where they fit in your training program.